Make sure the oat or buckwheat cereal you use passed our tests and is right for you! Oats are the basis of many popular cereals including Cheerios, rolled oats (often called oatmeal), steel-cut ("Irish") oats, as well as oat bran. Concern about these products was raised in 2015 when researchers reported finding ochratoxin A, a potential human carcinogen, in 70% of oat-based cereals purchased across the U.S. In addition, although oats do not naturally contain gluten, oat-based cereals can be contaminated with gluten if exposed to wheat during processing. 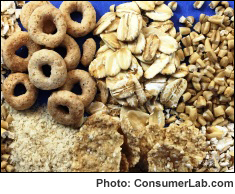 Out of concern, ConsumerLab.com purchased and tested many popular oat cereals, as well as one buckwheat (kasha) cereal. The good news is that most products were not found to exceed contamination limits for ochratoxin A (although it may be best to limit use of one of the products if it is to be given to small children). The not-so-good news is that significant amounts of gluten were found in several oat products. ConsumerLab.com tested products against the FDA "gluten-free" standard (no more than 20 ppm of gluten) as well its own, more stringent "ultra gluten-free" standard (no more than 5 ppm). Not all FDA "gluten-free" products met CL's higher standard. At the same time, some products which were not labeled gluten-free actually were. All products were also tested for contamination with lead, cadmium and arsenic. Avoid problems and get the best oat cereal using ConsumerLab.com's reviews and recommendations. In this comprehensive review you'll get test results and reviews for 20 products selected by ConsumerLab.com (19 oat cereals and one buckwheat cereal).